Want to know it feels like to be at the top of Europe? Then you should visit Jungfraujoch in Switzerland. 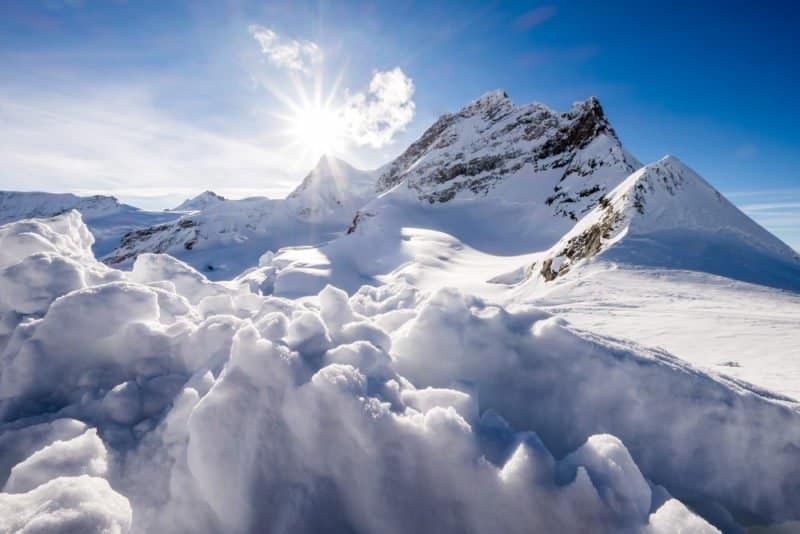 The Jungfraujoch is one of the top places to visit in Switzerland. 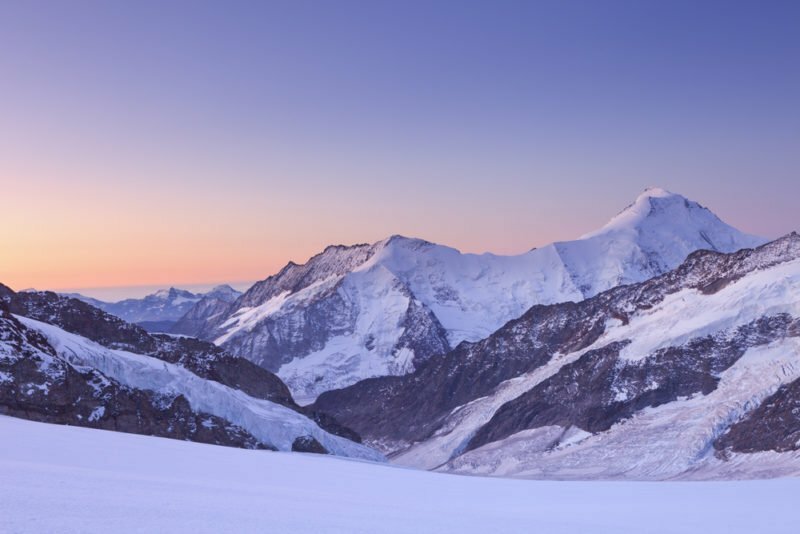 Find out about a day trip to Jungfraujoch – what to do and what to see at Jungfraujoch and what to know beforehand. Visiting the “Top of Europe” at about 3,500 meters height is quite an experience and I totally get the reason why it is one of the most famous tourist attractions in Switzerland. Jungfraujoch is pass in the Bernese Alps, connecting the two peaks of Jungfrau Mountain and Mönch Mountain, 3,466 meters above sea level. 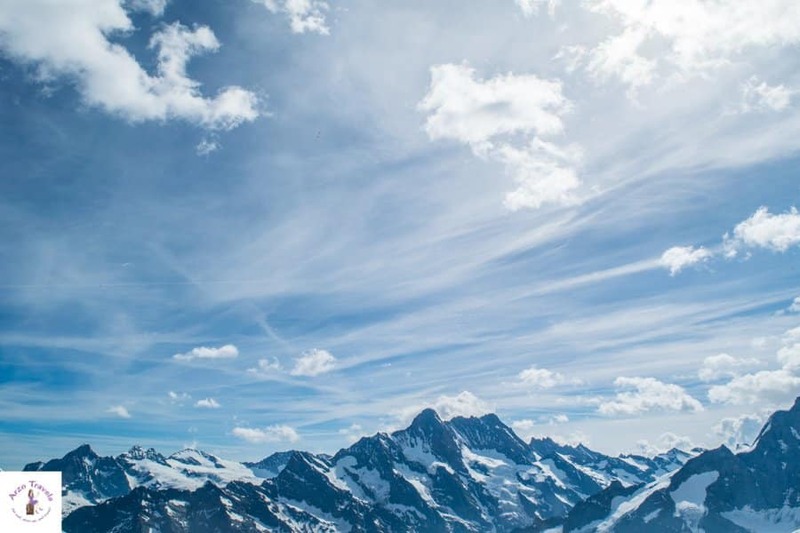 Snow on the Alps is guaranteed throughout the year. 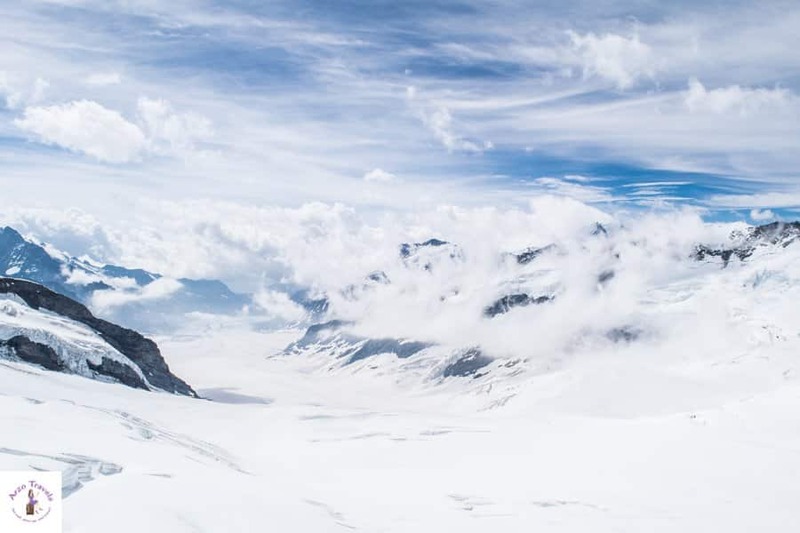 Visiting the Jungfraujoch is one of the most popular activities in the area and here are more tips things to do in Interlaken/Jungfrau. 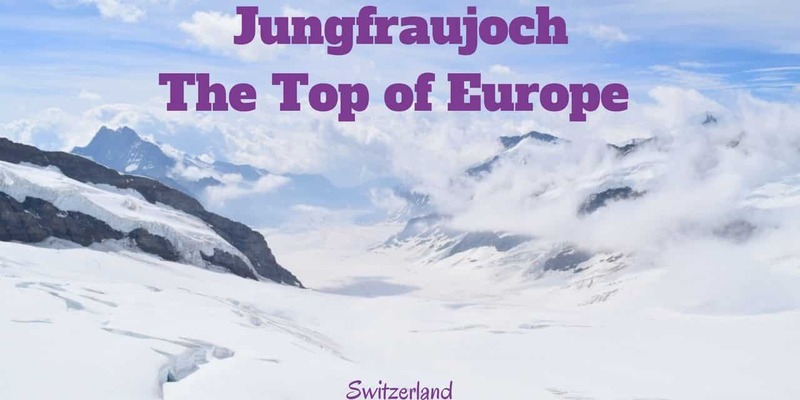 There is also so much to do at Jungfraujoch and here are the most important information I have summed up for you when visiting the top of Europe. 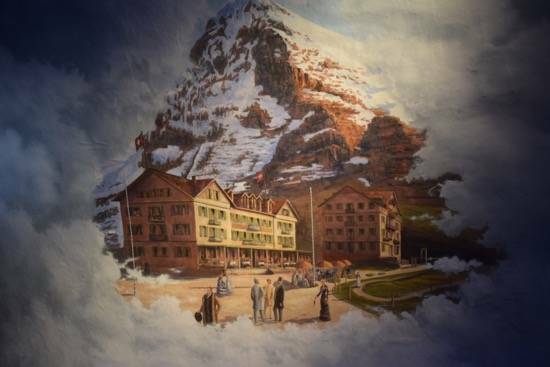 You cannot stay overnight at Jungfraujoch but you can book accommodation close by. Grindelwald is a popular place to stay or Interlaken. 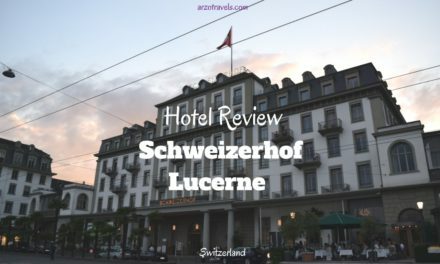 Click here to read my general guide on places to stay in Switzerland – or check out my post on places to stay in Interlaken. 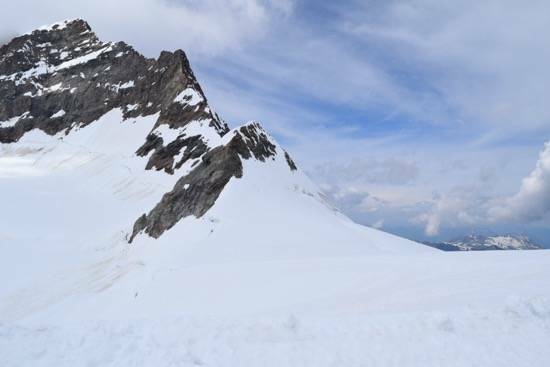 It is not possible to hike up all the way to Jungfraujoch (at least not for the ordinary mortals like you and me). However, you can hike some parts but for most of the part you have to use the Jungfraubahn tram. 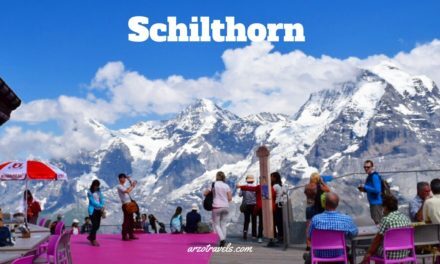 I went from Grindelwald (review of the Wellnesshotel Caprice Grindelwald where I stayed) to Kleine Scheidegg – there I changed the train and headed to Jungfraujoch, on my way passing beautiful places and gorgeous scenery. This trip took about 1,5 hours (7km). It is also possible to get there from Interlaken. 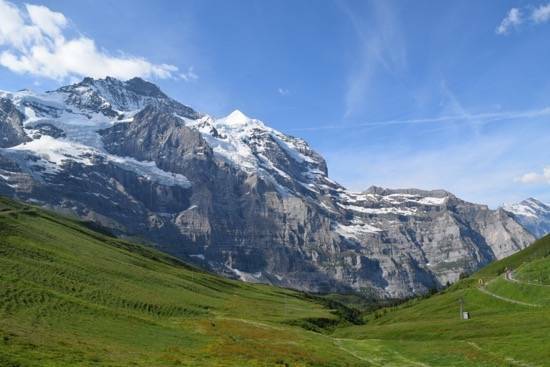 If you enjoy doingo some hiking you could hike to Kleine Scheidegg and take the train from there. The ride up there is stunning: passing beautiful places and gorgeous sceneries are part of this train trip. There were several stops (Eismeer, Eigerwand) where I got out and enjoyed the view of the beautiful snow-capped mountains – and I drove a lot through tunnels. 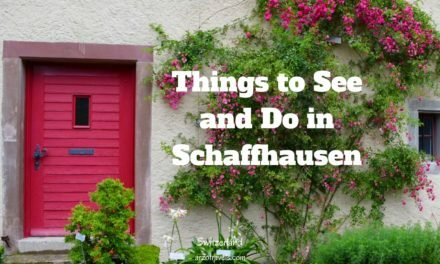 Each stop is worth it to get out and have a look around (especially at Kleine Scheidegg which is a very popular attraction itself). Here are the best places to visit at Jungfraujoch and the best things to do. Find some more information on each of the activities. 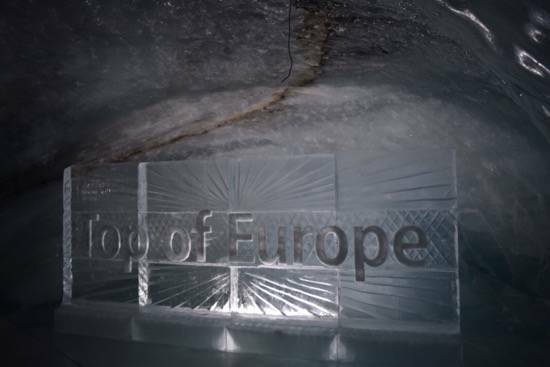 The Ice Palace is an interesting place just made of ice – aisle of ice, sculptures of ice – this is definitely a fun way to discover the Jungfraujoch and I am sure not only the kids will love it. This little exhibition is stuffed with a lot of interesting information about the history and present of the region. It also gives you information on how it was even possible to make the Jungfraujoch accessible to visitors. This part made me feel like a little kid again with all the lights and little figures. Why not do some winter sport throughout the year? I did not do some but at Jungfraujoch it is possible even in summer. My dog and I preferred to play in the snow instead and feel like kids. Top of Europe Store – you can even buy a chocolate produced by the Jungfraubahn (and I got a shirt for my nephew). 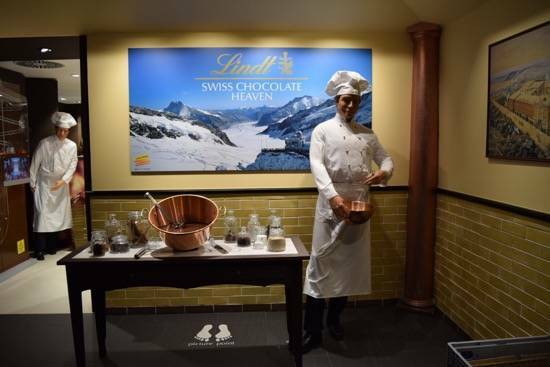 Here is also Lindt Chocolate Heaven – where a lot of information on chocolate production is offered. Unfortunately, I am addicted to chocolate and Lindt is one of my favorite chocolate brands (no, I do not get compensated in any way to say it, even the very basic milk chocolate is more than delicious). The Sphinx Platform (3571 meters) offers the best views of the region – and on clear days not only you can view the region but then you can also overlook France, Italy, and Germany. I am not used to be in the mountains and felt the attitude a bit and felt a bit dizzy but I was fine to continue because the views are priceless. The Aletsch Glacier is directly at the foot of this observation platform. It is definitively worth a visit. 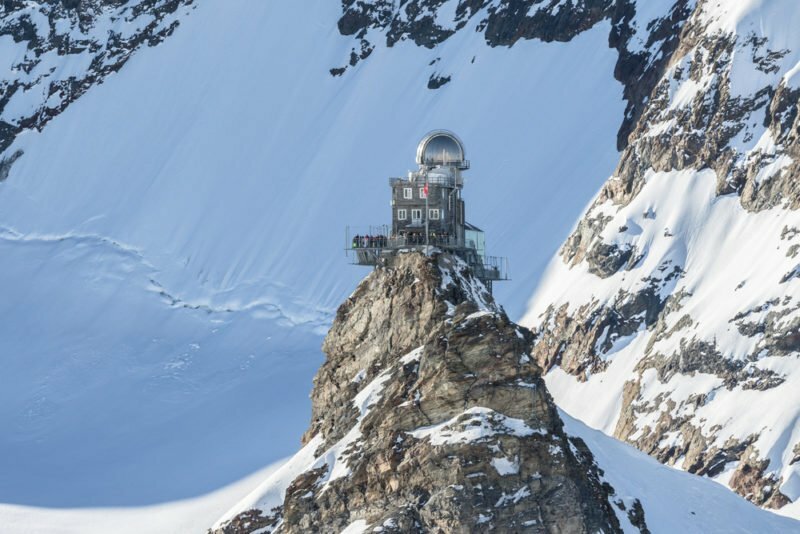 View of the Sphinx Observatory on Jungfraujoch, one of the highest observatories in the world located at the Jungfrau railway station. Of course, there are several dining opportunities: Indian, Asian, fast food, etc. so basically something for every choice and every budget (keep in mind it is still Switzerland). I had a vegetarian lunch at Gletscher Restaurant which was delicious and offered nice views. I also had a short coffee stop on the way down at Eigergletscher. There is also a cafe and you can explore the surroundings a bit. If you visit Jungfraujoch you´ll probably spend a full day with getting there so be prepared to get hungry. I admit that I was a bit shocked when I saw the prices for the first time. After spending a lot of time in Switzerland I have understood that Switzerland is just expensive for tourists (and probably for Swiss people as well). After seeing how much other tickets for mountain peaks costs, the price of about 200€ seems reasonable (depending from where your journey starts). You get a discount with a Swiss Travel Pass. Click here for more information. 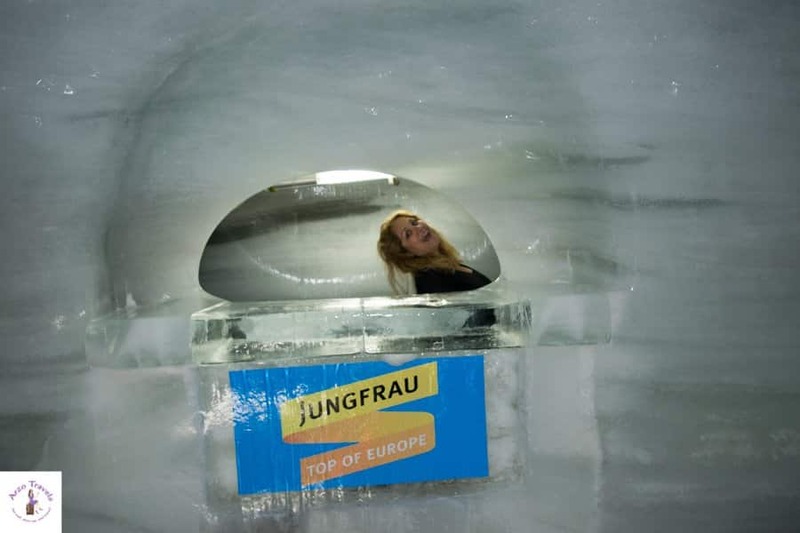 With a Jungfrau Travel Pass you get a discount. 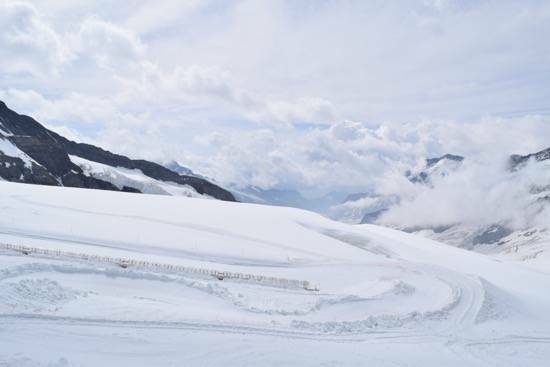 Wear layers: getting up Jungfraujoch means it gets colder, so be prepared for some temperature changes. Budget tips: If you are on a budget bring your own drinks and some snacks. There is a lot to buy, but as always, they might be a bit more expensive and being in a train for so long makes me hungry and thirsty. There is a reason why a visit to the Top of Europe is one of the most famous tourist attractions in Switzerland. Though getting up there by train is not very cheap (if you stay in the region of Jungfrau you should check out the travel passes which give you discount on this trip) is was definitely a great experience and I would love to visit this gorgeous place again. Disclaimer: I was invited by the Jungfraubahn AG and Jungfrau Tourism Office but, as always all the opinions are my own. I was also guided by a great tour guide Erika and would like to thank her a lot of patiently answering all my questions. 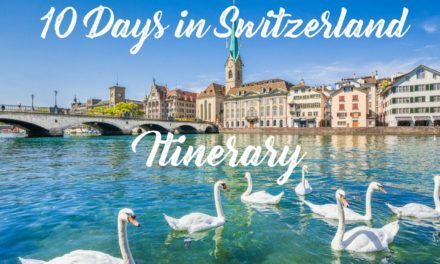 36 Hours in Appenzell- What to Do?